…a mysterious, magical, complex, difficult, imaginary, thought-provoking, inspirational, intuitional, joyous, immeasurable, ecstasy, and indefinable. … the wilful intent to serve the well being of another. …is patient, love is kind. It does not envy, it does not boast, it is not proud. It is not rude, it is not self-seeking, it is not easily angered, it keeps no record of wrongs. …to always protect, always trust, always hope, always persevere. …like quicksilver in the hand. Leave the fingers open and it stays. Clutch it, and it darts away. …an ideal thing, marriage a real thing. …the answer to “all” questions! …waking up to find the object of your affection in the dream you were having asleep on your shoulder. … a story that can never be fully expressed. … seeing an imperfect person perfectly. …a bond or connection between two people that results in trust, intimacy, and an interdependence that enhances both partners. …the ability and willingness to allow those you care for to be what they choose for themselves, without any insistence that they satisfy you. … the only feeling which is its own cause and its own effect. It is something illogical and yet above all logic. …looking past imperfections in your partner and seeing the beautiful person inside. True love seeks the happiness and well being of your partner. … loving someone without expecting anything in return; no judgments, no restrictions; no limitations; no expectations! …embracing differences and discovering ways in which to build a common lifestyle, share decision-making, and taking equal responsibility for the results. …to like with a great intensity. …the force that brings about unity and harmony. …that condition whereby the happiness of another is essential to your own. …the most beautiful gift you can give to your partner. Although love is at the root of our basic nature, Love for another human being must be cultivated. It takes time for Love to mature. Perhaps. 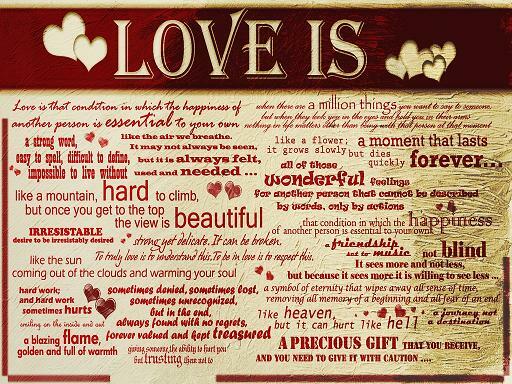 . . Love just Is. While in its allness and in its nothingness, all we need to do is simply let it Be.